This service features contemporary worship music by our Genesis band, as well as communion and candle-lighting as we usher in Christmas together. This service will take place in the Sanctuary for the first time this year. This year, we'll offer a free family photo with a photographer, in front of the Christmas tree in the King Parlor. Have your family photo taken before or after worship, and we'll give you a card with details on how to download the photo when you get home. The angels and shepherds gather to adore the newly born Jesus in our 4pm Family Worship service on Christmas Eve, led by SHINE Children's Ministry. "Mary" and "Joseph" welcome the baby Jesus in our Family worship service, 2015. A young churchgoer makes things merry and bright on Christmas Eve. Our Family worship services at 2:30pm & 4pm are designed for all ages. Our Genesis worship band leads on Christmas Eve, 2015. This year, Genesis worship will be in the Sanctuary at 10pm. Dr. David Swanson prepares communion in our Traditional Christmas Eve worship service. John Easterlin sings O Holy Night in our Traditional Worship service on Christmas Eve. This year, Traditional worship will be at 6pm and 8pm. Our Advent wreath, in the Sanctuary in 2015. As our church family prepares for Jesus, the Advent wreath will be fully lit by Christmas Eve. Our nativity participants in Family worship listen avidly to Dr. Swanson as we prepare to light candles together on Christmas Eve, 2105. One of our church family lights the advent candles, symbolizing our own light in the world on Christmas Eve. Dr. Swanson welcomes guests at our Christmas Eve worship services in 2015. Dr. Swanson shares a message in 6pm, 8pm and 10pm worship services. 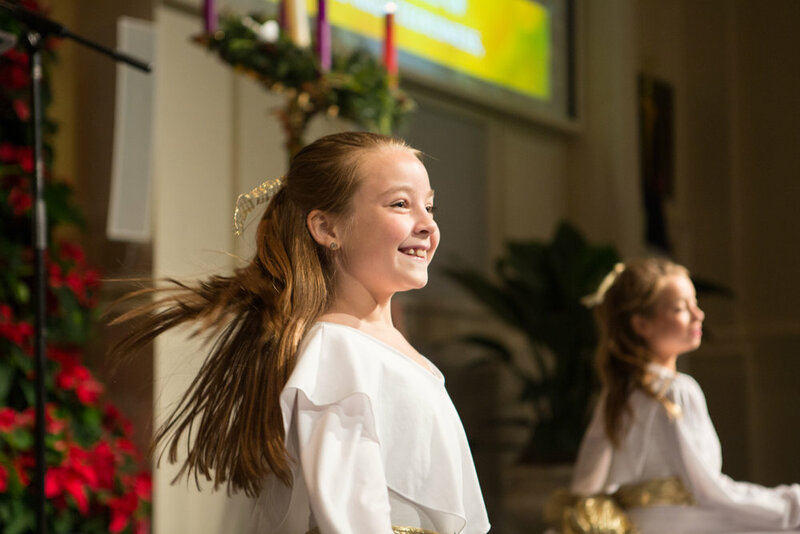 Our liturgical dancers celebrate during the 4pm Family worship service on Christmas Eve, 2015. Genesis singing O Holy Night, Christmas Eve 2015. Our Genesis service features contemporary worship and will take place in the Sanctuary for the first time this year, at 10pm. Children participate in candle-lighting at the 4pm Family service on Christmas Eve, 2015. All ages are welcome. Worshippers light the world together on Christmas Eve, 2015. Greeters welcome guests to our Christmas Eve worship services, 2015. This year, you can be a greeter and make the season bright: learn more at fpco.org/elves. A family lights the Christ candle in our Advent wreath during our Christmas Eve service, 2015. Does your family want to light the candles this year? Email Lisa Booth to sign up. Liturgical dancers celebrate in our Family Worship service on Christmas Eve, 2015. Bret Allen, Minister of Family Life, serves communion by intinction in our Genesis worship service on Christmas Eve, 2105. Our 6pm, 8pm and 10pm worship services celebrate communion on Christmas Eve. The angels announce Christ's arrival to the shepherds in our Family Service, Christmas Eve 2015. Worshippers hold their candles aloft at the conclusion of our Family service, Christmas Eve 2015. A worshipper lights the candle of the person next to her, Christmas Eve 2015. Genesis worshippers hold their candles aloft, Christmas Eve 2105. All of our worship services feature special candle-lighting at the conclusion of the service. Our Chancel Choir leads in worship alongside an orchestra, organ and guest musicians in our Traditional Christmas Eve service. Light fills the Sanctuary as worshippers hold their candles aloft, Christmas Eve 2015. "Let light shine out of darkness." Lighting the world, Christmas Eve 2015. Greeters welcome this radiant lady to our Sanctuary on Christmas Eve, 2015. One of our smaller participants returns his candle as he exits Christmas Eve worship, 2015. Musicians confer in our Family worship service, Christmas Eve 2015. Greeters welcome worshippers at our 4pm Family Service on Christmas Eve, 2105. The church gathers for worship during our 4pm Family service, Christmas Eve 2015. The gathered church prays, Christmas Eve 2015. Our REJOICE! Children's choir celebrate the birth of Jesus during our Family worship service, Christmas Eve 2015. The inn keeper sends Mary and Joseph to the stable, Christmas Eve 2015. Two young attendees try for a better view, Christmas Eve 2015. Spirits are merry and bright, Genesis worship, Christmas Eve 2015. Our REJOICE! Children's choir celebrates the birth of the King of kings with appropriate joy, Christmas Eve 2015. Regular SHINE Children's Ministry and childcare is available.